Yesterday, despite a better-than-expected HSBC flash PMI from China, most Asian markets ended lower on profit taking after rallying to multi-year highs amid concerns over weak earnings reports from Apple and Hyundai Motor. Sentiment was also dampened by news that North Korea might conduct a new nuclear test and additional long-range rocket launches. Prior to a public holiday on 24 January, KLCI continued with its relief rally, gaining 6.6 points after hitting a low of 1602 (22 January). Selling pressure moderated as trading volume decreased to 1.16 billion shares worth RM1.67 billion against 22 Jan’s 1.27 billion shares worth RM2.23 billion. Market breadth also improved as gainers/losers ratio jumped to 1.4x against 0.59x on 22 Jan and 0.09x on 21 Jan.
Barring the dissolution of Parliament in the near term, KLCI could stage further relief rally amid its sharp correction of 5.8% from all time high 1700 (4 January) to a low of 1602 (22 January). Technically, the rebound above 200-d SMA (now at 1624), the golden cross in hourly MACD, the hammer candlestick formation and the refill of 8.6-pt gap on 23 Jan augur well for further recovery towards 1645 (61.8% FR) and 1650 (50-d SMA) levels. Having said that, unless KLCI can penetrate and maintain its posture above the 50-d SMA support-turned-resistance, the rebound is not likely to be sustainable and the index may retrace back 200-d SMA and 1600 psychological supports again amid election jitters. We still advocate investors to SELL INTO RALLIES as further surge will trigger profit taking and de-risk ahead of the major event risk i.e. 13th general election. We believe that 2013 could be a year of two distinct halves, with 1H likely to be volatile as the general election has to be held no later than end-Jun while 2H to be more promising and Bursa Malaysia should perform better to reach our Institutional Research’s year-end target of 1750 when risk appetite returns, but largely dictated by the election outcome. Amongst all the bills that you have to compulsorily clear every month, credit card bills should be your top priority. One late payment have the potential of hurting your credit score badly and cost you a lot in the long run, even if it was a result of a sheer mistake. However, if you are already aware of the fact that you would not be able make payment within time, then you should try calling them up and negotiate with them to control the damage. The credit companies promote the different range of credit cards available to the diverse categories of customers not out of altruistic motives. The reality is that they are providing you with all these facilities because they are going to earn a grand profit by providing you with the money when you are in need of it. Due to all the defaults in payment from the various clients, they approximately loose out about 60 billion USD every year. The strict measures that are being taken up by the credit card companies in case of late payment even for a day is owing to the fact that they categorize all the late payer as defaulters. Therefore, even if you have defaulted only once it is definitely going to impact your credit score. The credit score is primarily a numerical digit that is used for expressing the credit worthiness of an individual. The credit score of an individual is basically dependent on his payment history of the loans and the credit cards as well as credit report. Approximately, 35% of the credit score is dependent on your credit card payment records of the past. Thus late credit card payment is certainly going to have a negative impact on the credit history of the individual. Though any default in credit card bill payment is not informed to the bureau till 30 days but after that serious actions are taken. The credit score will drop according to the different tiers of default payments and it generally varies between 60 points to 110 points. A good credit score increases the credit worthiness of the person i.e. he or she is being regarded as a dependable individual who will fulfill his or her responsibility to give back the borrowed money in time. An individual with better credit score enjoys a lot of benefit like lower interest rates and flexible terms. However, if your credit score suddenly drops down it is automatically going to affect the interest rate of the loans that you have already taken as well as the interest rates on your credit card. Therefore in the long run you will end up losing a lot of excess money just for your negligence. Once you have been tagged as a defaulter, then it will take at least one year to regain back your previous score. But it can stretch up to three years depending on the gravity of the problem. Therefore, a small negligence on your part has the potential of bringing about a massive difference in your current financial standing. So play safe and be more responsible to avoid any such situation. The above article is written by AJ who is associated with Page Once as their supporting staff. In her free time, she loves to share her knowledge via her articles on different niche including finance and politics. She recommends only Cox cable bill pay for smoother and hassle free transactions advises to check www.cox.com for more details. 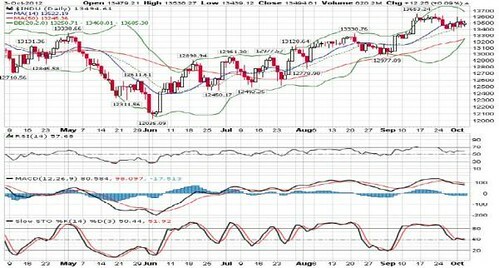 Daily Dow Jones: More Range Bound Consolidation Within The 13200-13700 Bands. The Dow Jones was higher by as many as 54 points after better-than-expected readings on the ADP report and ISM services data. Nevertheless, early gains were reduced to 12 points as ongoing worries over a global slowdown kept investors on edge following disappointing China’s PMI services index and the euro zone composite PMI data. Sentiment remains cautious ahead of the nonfarm payroll reports (5 October) as well as the kickoff of 3Q12 earnings next week, following another negative forecasts from Dow Jones' components i.e Hewlett Packard, which saw its price nosedived 13% to US$14.91. 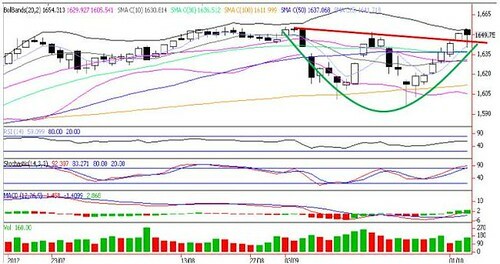 Daily Dow Jones - More Range Bound Consolidation Within The 13200-13700 Bands. After our “Downside bias” call on crude oil prices on 18 Sep, oil prices had tumbled from US$96.6 to US$88 yesterday. The fall was in line with slowing global demand amid weakening economic data and an EIA report that U.S. domestic oil output had hit the highest level in nearly 16 years last week. After the 4% overnight plunge, daily and weekly technicals are deteriorating, signaling further downside consolidation moving forward. 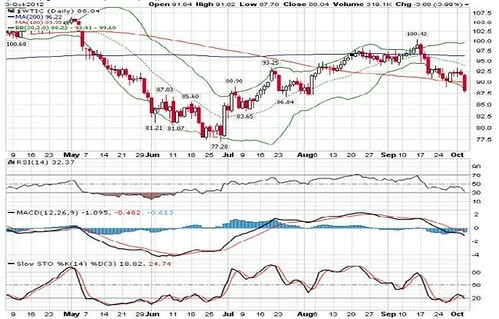 We expect more pullback towards 84.9 (76.8% FR from top 114.8 and low of 75.7) and 81.9 (200-w SMA) in the short term. More solid supports are 79.6 (weekly lower Bollinger band) and 77.3. Immediate resistances are 90.0, 92.8 (14-d SAM) and 94.6 (30-d SAM). A more formidable resistance zones are 96.2 (200-d SMA) and 99 (daily upper Bollinger band). 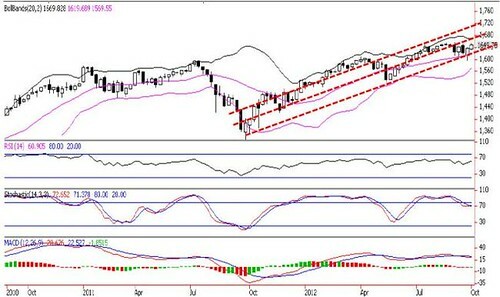 Daily WTIC - Downtrend Amid Bearish Technicals.